From planning your outfits to designing your home with beautiful images, Two Leaf Photography makes every portrait session a fun and customized experience! We offer a wide variety of unique products and will help you turn your beautiful images into lasting memories! Please contact us for pricing information on our beautiful products. Our 10X10 Flush Mount Albums includes lay-flat binding, fuji crystal archive paper and a micro-fold crease for a very tight crease. Choose to cover your album in beautiful japanese silk fabrics, natural linens, or gorgeous buttery leather. Each album includes 10 spreads (20 pgs). Our beautiful Fine Art prints are printed on Kodak Endura Professional Papers and have a standard archival value of 100 years in home display; 200 years in dark storage. All Fine Art Prints are UV coated and come mounted on styrene – a 3mm smooth plastic board that will not warp from humidity or moisture. Proudly display your printed memories in a frame or on an easel as a stunning stand alone piece. Our breathtaking Image Blocks are made up of mulitple photo prints wrapped around 1” thick wood blocks. 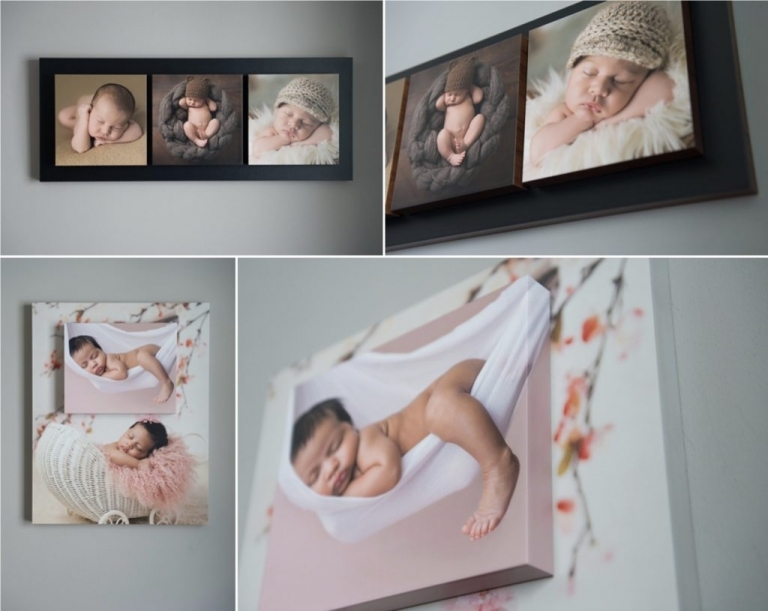 Multiple blocks are then secured to another image block that acts as the base, adding beautiful dimension to your walls. Our 4×4 wooden Image Cubes are a fun way to display your photos to create a striking hands-on display. Add dimension and beauty to any desk, shelf or table. 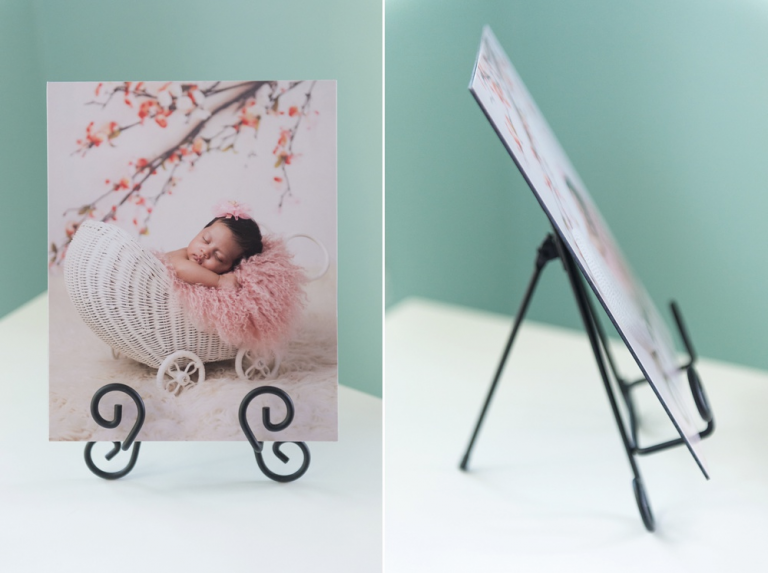 Our 8×10 Fine Art boxes are a true artistic twist to print presentation and a great alternative to an album. These handmade, clamshell-style presentation boxes with ribbon-tie closure holds up to 15 (5×7) slip-in Frame Mounts. A Fine Art easel is also included for you to showcase your favorite memory of the moment. Storyboards are a fantastic way to display 8 of your favorite images from your session on a beautiful 16×20 gallery wrapped canvas. For newborn clients, your little one’s full name and date of birth will be included in the collage to add a nice customized touch. Our remarkably crafted framed prints come in an array of sizes, mouldings, and mats. Pair a warm, low contrast print with a Toffee Crunch or Rum Raisin moulding for a popular vintage feel. Or, go modern with a slim, sleek moulding in Onyx or White. Our Mini Accordion Albums come as a set of 3 and are the perfect way to show off your beautiful memories on the go! These little albums are portable and magnetic, making them perfect to carry in your purse, stick on the fridge, or gift them to grandparents! Nothing shows off your artistic side quite like a Gallery Wrap. Gallery Wraps come printed on premium canvas, wrapped around a stretcher bar, and arrive ready to hang. Choose from a variety of sizes or let us customize your walls with one of our many unique canvas wall collections. Have a DIY spirit and want the flexibility and ownership of your high resolution digital images? Our digital files are delivered completely retouched, print ready, and capable of being enlarged up to 30×40. A printing guide and release form will also be included to help you turn your digital files into printed masterpieces!